In chess, the king (♔, ♚) is the most important piece. The object of the game is to trap the opponent's king so that its escape is not possible (checkmate). If a player's king is threatened with capture, it is said to be in check, and the player must remove the threat of capture on the next move. If this cannot be done, the king is said to be in checkmate. Although the king is the most important piece, it is usually the weakest piece in the game until a later phase, the endgame. Initial placement of the kings. Possible movements of the unhindered king piece. Possible movements of the king piece when hindered by the borders or other pieces. The black king cannot move to the squares under attack by the white bishop, the white knight, the white queen, or the white pawn, and the white king cannot move to the squares under attack by the black queen. White has just played Rd1#, checkmating the black king. White starts with the king on the first rank to the right of the queen. Black starts with the king directly across from the white king. With the squares labeled as in algebraic notation, the white king starts on e1 and the black king on e8. A king can move one square in any direction (horizontally, vertically, or diagonally) unless the square is already occupied by a friendly piece or the move would place the king in check. As a result, the opposing kings may never occupy adjacent squares (see opposition), but the king can give discovered check by unmasking a bishop, rook, or queen. The king is also involved in the special move of castling. In conjunction with a rook, the king may make a special move called castling, in which the king moves two squares toward one of its rooks and then the rook is placed on the square over which the king crossed. Castling is allowed only when neither the king nor the castling rook has previously moved, when no squares between them are occupied, when the king is not in check, and when the king will not move across or end its movement on a square that is under enemy attack. Moving the king to an adjacent non-threatened square. A king cannot castle to get out of check. Interposing a piece between the king in check and the attacking piece in order to break the line of threat (not possible when the attacking piece is a knight or pawn, or when in double check). If none of these three options are possible, the player's king has been checkmated and the player loses the game. If this happens, the king is said to have been stalemated and the game ends in a draw. A player who has very little or no chance of winning will often try to entice the opponent to inadvertently place the player's king in stalemate in order to avoid a loss. In the opening and middlegame, the king will rarely play an active role in the development of an offensive or defensive position. 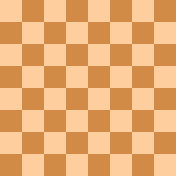 Instead, a player will normally try to castle and seek safety on the edge of the board behind friendly pawns. In the endgame, however, the king emerges to play an active role as an offensive piece as well as assisting in the promotion of their remaining pawns. It is not meaningful to assign a value to the king relative to the other pieces, as it cannot be captured or exchanged. In this sense, its value could be considered infinite. As an assessment of the king's capability as an offensive piece in the endgame, it is often considered to be slightly stronger than a bishop or knight - Emanuel Lasker gave it the value of a knight plus a pawn (i.e. four points on the scale of chess piece relative value) (Lasker 1934:73). It is better at defending nearby pawns than the knight is, and it is better at attacking them than the bishop is (Ward 1996:13). Finial, top of King, often a monarch's.